We supply air dried and kiln dried firewood which is perfect to burn straight away. Whether it be hardwood or softwood it’s all sourced locally and harvested from sustainably managed woodland. An easy way for us to deliver logs in volume, the bulk bag can be slid off our trailer into a convenient location for you to fill your own barrow, or we can stack for you for a small additional fee. *Please note: We don’t carry a barrow unless bought in advance, so if you need barrow and/or stacking as we deliver, the cost for stacking will be £25 (payable before we unload). Barrow bags can be loaded into the back of your car or delivered to your home, and they can be easily moved to your stacking location with a sack or wheel barrow. 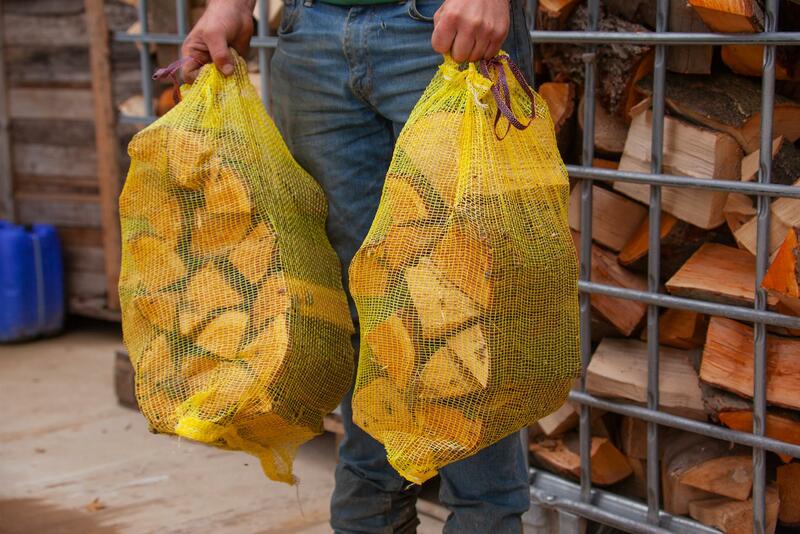 Easy to carry and stack in your car, and logs can be left in the net bags and stacked for your convenience. kindling: Bagged kindling is easy to carry and stack, ready for quickly lighting your fires. Prices include 5% VAT for domestic use; please contact us for bulk purchasing and business use.